Modular instrumentation was born with the use of the PC in the world of testing and measurement. Originally, the offer consisted mainly of signal acquisition cards in the format of the PC buses in which they were plugged. 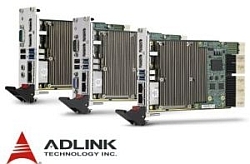 For high-performance test applications, VXI modules (VME eXtension for Instrumentation) have been deployed for years but they have virtually disappeared in favor of the PXI (PCI eXtension for Instrumentation), created in the late 1990s and has been widely adopted by many manufacturers. The GPIB bus for controlling a traditional instrument by a PC has gradually been replaced by the Ethernet and USB interfaces. This has contributed to the appearance of the modules connecting to the PC via their USB connection. They are reserved for applications requiring less speed and implementing fewer channels. The LXI interface (LAN Extension for Instrumentation) is more suitable for higher transfer rates via an Ethernet link. Many traditional instruments are today equipped with it. Finally, the modular instrumentation offering, always controled by an external PC or embedded in a chassis, essentially includes USB, LXI, PCI, PCIe, PXI and PXIe modules.